The PetSafe® Pawz Away® Mini Pet Barrier keeps your pet away from a certain room, away from trash, off of furniture, etc. Just place the Barrier Transmitter near the area your pet should avoid. The Mini Pet Barrier transmits an elliptical radio signal adjustable up to 5 feet. Your pet wears a Receiver Collar with Contact Points that touch his neck. 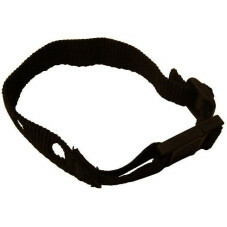 When your pet enters the Barrier Area, he’ll hear a series of audible tones from the Receiver Collar and he will feel a safe Progressive Static Correction, delivered through the Contact Points on his neck. The Progressive Static Correction will get his attention, but will not cause harm. The correction continues until your pet leaves the Barrier Area. The PetSafe® Pawz Away® Mini Pet Barrier has been proven safe, comfortable, and effective for pets at least 6 months old and 5 pounds or more. The barrier also allows you to keep certain pets away while giving other pets access. When the Barrier Transmitter and Receiver Collar are set to mode A, the Barrier Transmitter denies access to pets wearing a Receiver Collar programmed to mode A. Receiver Collars set to mode B will not pick up the signal from a Barrier Transmitter set to mode A. When the Barrier Transmitter and Receiver Collar are set to mode B, the Barrier Transmitter denies access to pets wearing a Receiver Collar programmed to mode B. Receiver Collars set to mode A will not pick up the signal from a Barrier Transmitter set to mode B. When the Barrier Transmitter is set to mode AB, the Barrier Transmitter denies access to all pets wearing the Receiver Collar, no matter which mode the receiver is programmed to. Turn over the Barrier Transmitter and rotate back cover counter-clockwise, removing the back cover. Install three AAA alkaline batteries and replace the back cover. Turn clockwise to secure cover. To turn the transmitter unit on, press the + button once, and a black bar will appear on the LCD. Adjust the range by pressing the + to increase and – to decrease the range. The black bar at the bottom left of the screen will increase or decrease each time. Each black bar is 2 feet (0.6m) diameter of range. To turn the transmitter off, press the – button until the LCD screen goes blank. Turn the ransmitter off. Remove the back cover. Flip the switch inside the battery compartment to Mode A or Mode B. Move the switch to the center position for mode B or to the right position for mode A. Start with the Barrier turned off. Turn receiver on and place it within 1 foot of the Barrier. Press and hold the – button, a bar will appear next to the current Mode. Press and hold the + button for about 5 seconds until one range bar appears. Keep holding both buttons until collar beeps 3 times. Collar is now set to the new mode. The Barrier Transmitter emits a radio signal from all sides in an elliptical pattern. The signal may transmit through a wall or the ceiling/floor. 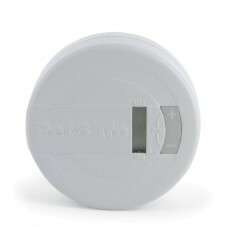 The Barrier Transmitter can be placed laying flat on a surface or hung on a wall. If you choose to hang the Barrier Transmitter, note that the signal becomes very directional—the signal will be strongest directly in front of and behind the unit. The signal is weakest to the side of the unit. Place unit near large metal objects such as refrigerators, washers, etc. Keeping your hands away from the Contact Points, use the edge of the Test Light Tool to turn the receiver battery door to the ON position. Hold the Receiver Collar with the Contact Points facing up. Place the Test Light Tool on the Contact Points so that the wire in the Test Light Tool touches the Contact Points. 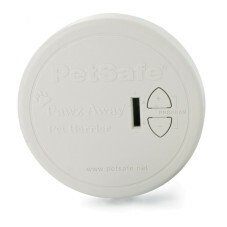 The PetSafe® logo on the Receiver Collar should face the Transmitter. Hold the Receiver Collar at the approximate height of your pet’s neck. Start outside of the range and walk slowly toward the Barrier Transmitter. 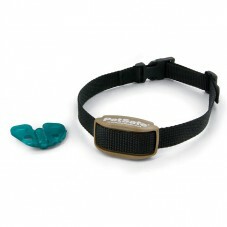 As you reach the Barrier Area, the Receiver Collar emits a series of high-pitched tones. For each tone you hear, you should notice the Test Light flashing which indicates that a Progressive Static Correction is being delivered. The Receiver Collar’s tone is easily heard by pets but may be at a volume level difficult for some humans to hear. 4. Check the range of the Barrier Area from multiple angles to ensure you are getting the desired coverage. Note: Should you find that you are not getting the desired range at the maximum setting, move the Barrier Transmitter a foot, or change from its standing-on-end position to laying flat. Metal objects can alter the magnetic field and change the transmitting signal range. 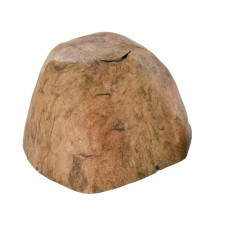 The effect on the range depends on the size and shape of the objects. Signal range can be reduced if the Barrier Transmitter is placed on a concrete floor, due to steel reinforcement in the concrete. For best range results, place the Barrier Transmitter on a nonconductive surface, i.e., wood floor or table. Placing the Barrier Transmitter beneath sofas and beds can reduce the range due to the metal springs altering the magnetic field. The PetSafe® Pawz Away® Pet Barriers teach your pet to avoid the Barrier Areas you have set after receiving a Progressive Static Correction. Your pet will learn that he is more comfortable when he avoids the Barrier Areas. In some cases, it may not be necessary to train your pet. You can let your pet wander freely to determine the new boundaries. Monitor your pet during his first session. Pets learn at different rates and it may take several times for your pet to successfully understand and honor the Barrier Areas. Move your pet away from the Barrier Area. 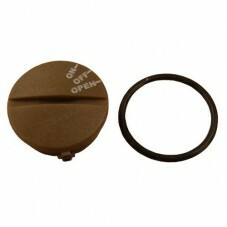 Activate the Receiver Collar by turning the battery door to the ON position. Place the Receiver Collar around your pet’s neck. Be sure that the Receiver is directly under your pet’s neck. Allow your pet to wander freely to learn the new boundaries. 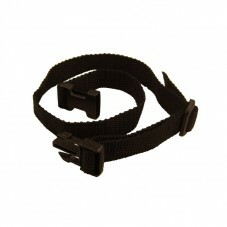 Place a second non-metallic collar on your pet ABOVE the Receiver Collar and attach a long leash. CAUTION: Be sure the extra collar does not put pressure on the Contact Points of the Receiver Collar. Walk your pet toward the Barrier Area. As soon as you hear the tone or you see that your pet is receiving a Static Correction, gently pull him away from the Barrier Area and back into the safe zone. Reward your pet with praise each time he leaves the Barrier Area. Practice this technique a few times until you feel that your pet is mastering avoidance of the Barrier Areas. Be sure to never force or entice your pet to enter the Barrier Areas. If your pet is having trouble recognizing the barrier, you may need to provide a temporary visual aid. PetSafe® Boundary Flags can be placed around the perimeter of the Barrier Area to help your pet understand where he is not allowed to roam. Once your pet is trained to respect the barrier, the flags can be removed. I can’t hear the Receiver Collar tone. Check or replace batteries in Receiver Collar. Pets easily hear tone but it may be a volume level that is difficult for you to hear. Use the Test Light Tool to check Receiver Collar for static correction. My pet does not react to the stimulation. Check/replace batteries in Receiver Collar. Use Test Light Tool to check for static correction. 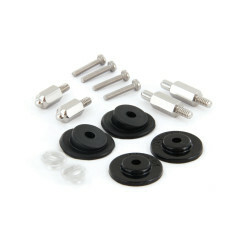 Check Receiver Collar fit to ensure Contact Points have direct skin contact. Check the setting on the Barrier Transmitter. Adjust Barrier Transmitter range to increase/decrease Barrier Area size. 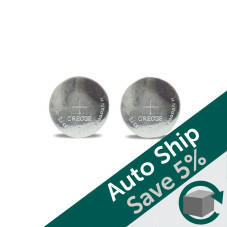 Check for metal objects close by. The Barrier Transmitter does not appear to work. Check segment indicator on Barrier Transmitter. Check/replace batteries in Barrier Transmitter. Increase the Barrier Area range on the Barrier Transmitter. Check that the Barrier Transmitter setting corresponds to the Receiver Collar setting. (i.e. Barrier Transmitter is set to mode A and Receiver Collar is synchronized to pick up mode A). There are no segments on the Barrier Transmitter. Press the UP (+) arrow button.